A part of the famous Palace Group, Cabaret Club is a relatively new casino launched in 2009. This casino is offered in various languages and it is absolutely safe as it is licensed by the jurisdiction of Malta. The highlight of this casino includes its state of the art software, appealing graphics and high quality animations. Cabaret Club Casino provides new players with a welcome bonus when they first sign up and make their first deposit. The casino instantly credits 100 % match bonus of up to $600 into the players account. The best part about Cabaret Club’s welcome bonus is that you can deposit as low as $20 and get $20 more as a bonus which is the perfect option for low budget players. However, there is no such thing as a free lunch therefore there are some conditions levied in this bonus as well. Compared to many other casinos whose bonuses come with strict wagering requirements, this casino has simpler play through which is 50x the bonus, that should be completed within a week. Cabaret Club Casino gives its players a chance to earn big prizes by accumulating special Club Points. When you wager $10 into your account, you collect 1 Club Point. Therefore 1,000 Club Points collected can get you $10 in which can be exchanged for cash. Play the maximum to collect Comp Points and reach various loyalty tiers namely. Blue, Silver, Gold and the highest Platinum. As you advance through levels, their bonuses will definitely give your gameplay a boost. 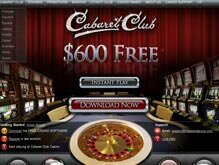 Cabaret Club is a downloadable casino that can be accessed through the web browser for instant play as well. The design of the casino is extremely sophisticated which makes gameplay even more interesting. Cabaret Club is powered by Microgaming and there are a suite of games available including slots, video poker, table games, and many other games. Slots form a major part of the gaming collection available at Cabaret Club. The casino comprises of multiple gaming types varying from simple games to advanced and engaging games. The casino keeps adding new slots such as Jurassic Park, Terminator 2: Judgment Day, Avalon and Mega Moolah as soon as they are released by Microgaming. Cabaret Club also offers progressive jackpot games loaded with huge cash prizes for games like Treasure Nile, Fruit Fiesta, Major Millions, and Mega Moolah. If table games or video poker games attract you, then you have got plenty of options to choose from. However, the variety is not as huge as slot games. 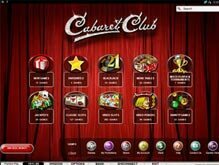 If your smart phone or tablet comprises of a Flash Browser then you can play at Cabaret Club on the move. This is the best option when you have a Blackberry or Windows Phone. Apple or Android users can download the casino’s app on their devices and start playing instantly. This app can be found at the Google Play and the Apple Store. 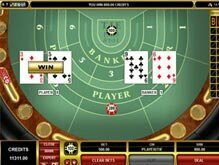 Although the application does not provide access to all the games available on the desktop, you can still choose from some good quality games from the roulette, poker and slots category. Downloading the mobile app makes your gameplay extremely easy as you can take out your mobile at any time to indulge in some quick gaming. As many people lead a hectic life, mobile gaming is a growing industry and many online casinos are getting in on the game. Apart from POLi, PaySafeCard, Citadel and eCheck, all the above mentioned methods can be used for withdrawals. Alternatively, there is also email support with for players who want to get their queries solved. Apart from the above mentioned methods of contact, players can contact the casino through the phone numbers listed on their website! Deposit Options: Credit Cards,Debit Cards,POLi,Neteller,Skrill (Moneybookers), PaySafeCard, EcoCard, ClickandBuy, Citadel, Instadebit, Direct Bank Transfer, Entropay, EziPay, eCheck. Withdrawal Options: Credit Cards,Debit Cards, Neteller,Skrill (Moneybookers), EcoCard,ClickandBuy, Instadebit,Direct Bank Transfer,Entropay,EziPay.